Anger seems to be a common struggle among moms. There will always be triggers that make us angry, it's what we do with our anger that matters. I think we often forget we are parenting children, not adults and raising people who are born into sin and prone to it, just like we are. This is all the more reason for us to parent our children with grace. 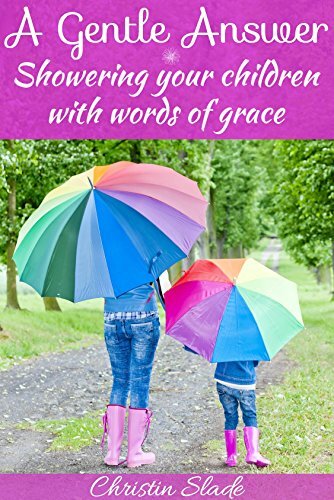 Parenting with grace does not mean our children get away with everything. Parenting with grace is simply how we approach conflict with our children. Discipline and correction are still given, but it is in the manner they are given which constitutes grace (or lack thereof). What we need is a perspective shift. God loves our children first. Our responsibility to them is great...it is large. But there are certain aspects of parenting that belong to God. While we can point our children to the Cross, God is the one who pricks and convicts the spirit. We must remember, raising children isn't merely a task to be done day in and day out. Raising children requires that we give of our time and attention to nurture them through love, service, and JOY. Sometimes the sheer demand of mothering can trigger anger within us. Some days, I'll be honest, I get weary of being needed constantly. That doesn't make anyone a bad mother; it makes us human and fallible. We just can't stay in that place, allowing anger to brew and erupt every time we have a child with a need. Of course no one likes it when there is resistance to something we're trying to perfect (or at the very least, "make better"). So, often our response will be out of frustration. We can approach the battle with a different perspective. Counteract our anger with solutions that will last rather than offer a temporary reprieve. We need to be armed with a grace-response knowing we may be met with resistance. Below are a few examples of how this might look. Your child needs to clean their room. You've been nagging them about it every time you walk by it and see it is still not clean. It sort of makes your blood boil because you're being ignored. Disobeyed. Disrespected. (At least that's how we perceive it). You can either dish out consequences, continue to nag, or offer to help your child, who is probably overwhelmed with the task. As an adult, does the idea of cleaning the garage or a packed storage room in your basement overwhelm you? That's probably an accurate picture of your child with their bedroom. Wouldn't it be better if someone offered to help you? Yes, our children need to learn responsibility, but it isn't something that will come to full fruition until they are on their own. In the interim, we can either chastise their failures or be the one who helps them succeed. Not only can we help them succeed in this endeavor, we are taking the time to nurture and build relationship with our child. Use it as an opportunity for growth, in both of you! Your child has lied to you. Again. Lying is one of your pet peeves and makes you angry because if makes you feel betrayed. Knowing that you have a child who consistently (or occasionally) lies, even after being disciplined, it's time to form a new strategy for tackling this battle. If you're prepared and ready as the next offense presents itself, you can paint an entirely new picture with a new outcome. Children often lie out of fear, so approaching in attack mode or demanding the truth is not the best idea. Your goal is to make your child feel safe to tell you the truth. Not only will this help break the cycle of lying (eventually) in your child, you both will form a deeper connection and level of trust with one another. Make telling the truth more appealing than lying. Don't offer treats or tricks, but offer trust. Find a way to communicate with your child that they can trust you (you won't blow up or over-discipline). Some instances may require a disciplinary act, but if it's minor, treat the truth as a reward and don't discipline. Build that trust instead by consistently and gently drawing out the truth. Two of your children are in a squabble. This has started to become a more regular occurrence and it's trying your patience. "Why can't they just get along?!" Well, they are children and they need to be taught and walked through how to handle conflict. You can yell down the hall or down the stairs to "Stop fighting!" Or, you can go to your children and walk through the conflict with them and help them solve it. Being proactive in this case, for both you and your children, may require a character study to help your children see the value in the other sibling. Being intentional about building relationships among our children will help lessen the fighting amongst them. I recommend "Making Brothers and Sisters Best Friends" by the Mally siblings. If you have children who are about 7 years old and older, you can read this aloud to them in small chunks at a time. The above examples are all scenarios I have gone through in my home. I have been the angry parent just punching out orders and discipline (and sometimes still am), but I'm learning a better way to help my children mature and it's doing life right alongside them. As parents, we need to remember our job isn't merely to correct and discipline our children for every fault. We are called and equipped to build up and support them as they grow. To walk alongside them, not send them off alone. Independence is good, but given too early could be more harmful than good. Feb 16 You Are Allowed To Feel Angry!